Tin Goose Films' new feature-length documentary, "Armstrong," coming in Spring 2019, tells the story of the first man to walk on the moon, Neil Armstrong. "Aviator, astronaut, husband, father, reluctant hero" — that is how a new documentary describes its title subject, the first man to step foot on the moon. "Armstrong," from Tin Goose Films, aims to tell the story of Neil Armstrong, from his youth to his command of the first lunar landing and what came after his return to Earth. The feature film, now in production, is due out in the spring. To bring Armstrong's life to the screen, Haviland has partnered again with the filmmakers behind "Mission Control: The Unsung Heroes of Apollo" and "The Last Man on the Moon," the latter a 2014 documentary about Apollo 17 astronaut Gene Cernan. Tin Goose Films unites Haviland Digital, Mark Stewart Productions and Hays Films. David Fairhead, who directed 2017's "Mission Control," is helming "Armstrong." Tim Craig, who shot "Last Man on the Moon," is cinematographer, with help from air-to-air photographer John Dibbs ("Mercury 13"). Gareth Dodds, who worked on both space films, joins Haviland as a producer. Apollo 11 astronaut Mike Collins in Tin Goose Films' documentary "Armstrong," coming in Spring 2019. Unlike "Last Man," which was filmed with Cernan's full participation prior to his death in 2017, "Armstrong" is being made without the benefit of its subject. Neil Armstrong died in 2012 at the age of 82. Instead, the new documentary relies on archived interviews with the Gemini 8 and Apollo 11 astronaut, as well as new remarks from Armstrong's friends and family, as well as retired and current astronauts. "What were the reasons that he was the one and the others were rejected?" says Michael Collins, Armstrong's Apollo 11 crewmate, in a trailer for the film, referring to Armstrong's selection to lead the first moon landing. "If you take the short view, it was probably that he was the best qualified." "He had been a combat pilot during Korea, he proved his metal there," says Collins. "He was flying the X-15 [rocket plane] and that put him above and beyond all of the rest of the candidates." Apollo astronaut Neil Armstrong, in NASA archival footage, as seen in Tin Goose Films' documentary, "Armstrong." "If you want to take a longer view, and you want to consider what was he going to be like after the flight? That was equally important. He wasn't going to go out and drink too much or make a fool of himself, he was a straight arrow," Collins says. David Scott, Armstrong's Gemini 8 crewmate, and flight directors Chris Kraft and Gerry Griffin also contributed new on-camera interviews for the film. In addition, "Armstrong" will use home videos and archival assets from both NASA and the Armstrong Archives at Purdue University in Indiana to bring viewers a more intimate view of the astronaut who often avoided the limelight. The home videos have not been viewed by anyone outside the Armstrong family until now. "We're delighted to be close to finishing a film we think will be dramatic, moving and deeply human," Haviland said. 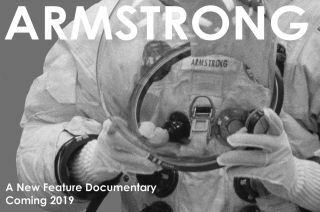 See the trailer for Tin Goose Films documentary "Armstrong" at collectSPACE.